It is difficult to be too superlative about this magnificent piece of work. It ties together research from a variety of disciplines and explicates a complex of disorders that has tantalized and largely baffled distinguished scientists from a variety of disciplines, including leading clinicians specializing in primary care, pulmonary, and psychiatric/psychosomatic medicine, basic physiology, psychology, and psychophysiology. Dr. Courtney has pulled together an encyclopaedic literature on the poorly understood topic of disordered breathing, which contributes to untold suffering and expense, from a multitude of symptoms that often remain ‘medically unexplained’. To read the whole of Dr Courtney’s groundbreaking thesis, please fill out your details and we’ll email you a link to download the PDF. We’ll also keep you informed with new research findings and information. The commonly held idea that ‘proper’ breathing is important for health is generally accompanied by the view that incorrect or ‘dysfunctional’ breathing has adverse effects on health. It has been proposed that correction of dysfunctional breathing through breathing therapy reduces symptoms and improves the health of patients with conditions such as asthma, anxiety, speech disorders, chronic muscular skeletal dysfunction and medically unexplained physical symptoms. However, investigation of the impact of dysfunctional breathing and breathing therapies is hampered by the fact that dysfunctional breathing is not well defined and that there are few validated measures or standardized protocols to measure it. To explore possible mechanisms of breathing therapy. A series of seven studies were untaken. These papers, which are all published (or in press) manuscripts, form the experimental portion of this thesis. The seven studies presented in the empirical section of this thesis are grouped in four sub-sections- The first of these contains two studies on the topic of ‘Measuring Breathing Pattern’, the second contains one study on the topic ‘Evaluating Dysfunctional Breathing Symptoms’, the third include two studies that investigate ‘Relationships between Measures of Breathing Functionality’ and the final sub-section contains two studies that explores ‘Measures of Dysfunctional Breathing and Breathing Therapy’. Various non-experimental and quasi-experimental study designs were used. The studies reported in Chapters 6 and 7 tested inter-examiner reliability and accuracy of manual breathing assessment tools. Chaper 8 involved administration of a survey with subsequent exploratory factor analysis of the survey items. Chapters 9, 10 and 11 were primarily correlational studies. Chaper 12 was a post-hoc analysis of clinical data. The participants in the study reported in Chapter 6 were 10 Yoga teachers or breathing therapists and 3 Osteopaths as examiners. The participants in the study reported in Chapter 7 were 56 Osteopaths and Osteopathic students. The 83 participants in the studies reported in Chapters 8,9,10 and 11 were either healthy or suffered from mild medical conditions. The 62 participants in the study reported in Chapter 12 were consecutive patients receiving treatment with a method of breathing and relaxation therapy called Whole Body Breathing. Manual techniques for evaluating breathing pattern appear to be useful and reasonably accurate for evaluating thoracic dominant breathing and paradoxical breathing. The Self Evaluation of Breathing Questionnaire appears to have two dimensions that might be related to biochemical and biomechanical aspects of breathing dysfunction. 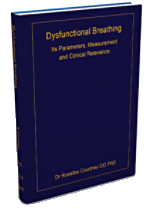 Poor relationships between different categories of measures of dysfunctional breathing suggest that dysfunctional breathing has several dimensions. Breathing pattern appears to moderate dyspnea and altering breathing pattern may be one mechanism of breathing therapy. While dysfunctional breathing cannot be strictly defined at present, for practical purposes dysfunctional breathing is probably best characterized as multi-dimensional. Dysfunctional breathing can occur in at least three dimensions: biochemical, breathing pattern and breathing related symptoms and these might not co-exist. Comprehensive measurement of dysfunctional breathing should include measures that evaluate all these dimensions. The therapeutic mechanisms of breathing theory are likely to be complex and include psychological, biomechanical and physiological parameters. However, dysfunctional patterns of breathing are one factor that influences patients’ response to breathing therapy. Also correction of dysfunctional breathing patterns is one likely therapeutic pathway of breathing therapy, particularly for patients with dyspnea.